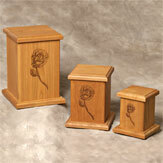 The Traditional Collection From MCS Supply Inc.
Handcrafted of select grain cherry wood. 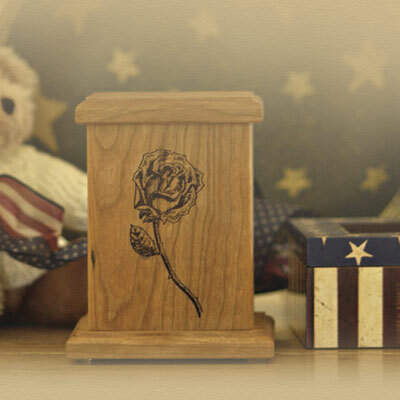 Laser-etched with delicately detailed rose design. Hand-rubbed oil finish. The bottom is removable for access and is secured by 4 screws. TSR (Small Rose) 4" x 4" x 5" 7 Cubic"
TMR (Medium Rose) 5" x 5" x 6½" 31 Cubic"
TLR (Large Rose) 6" x 6" x 8½" 92 Cubic"
Handcrafted of select grain cherry wood. Laser-etched with delicately detailed willow design. Hand-rubbed oil finish. The bottom is removable for access and is secured by 4 screws. 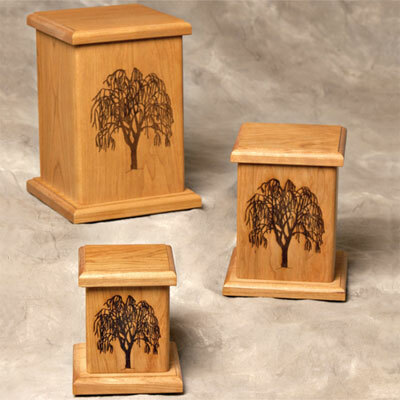 TSW (Small Willow) 4" x 4" x 5" 7 Cubic"
TMW (Medium Willow) 5" x 5" x 6½" 31 Cubic"
TLW (Large Willow) 6" x 6" x 8½" 92 Cubic"